Trading on divergences and convergences between related markets can produce profitable trades with very high success rates. Strategies that exploit relationships between markets are a favored play of the institutional trader. Yet intermarket analysis as it’s called is a missed opportunity in my view. Many traders ignore the subject almost entirely, preferring to focus on one market at a time. So those open to learning about this method can certainly gain an advantage. Financial markets don’t exist in isolation. Many have fairly predictable inter relationships with each other. Intermarket analysis is the study of these interactions. The table below shows some relationships. Australian and New Zealand dollar Australia is a big producer of raw materials and tends to benefit from commodity upcycles. AUD tends to appreciate relative to other currencies in such cycles. New Zealand’s economy is closely coupled to that of its northern neighbor. FTSE-100 and copper Canada is a major oil exporter and its economy is tied to the commodity cycle. The FTSE-100 share index is heavily weighted in mining and commodity stocks and tends to suffer when commodities are weak. Japanese yen and commodities Japan is a net importer of raw materials and its industries are sensitive to these cost. Rising commodity prices tends to be negative for the yen. Industrial base metals and global interest rates Rising raw material costs often portend rising inflation, and as such higher global interest rates. Stocks and bond prices Stock prices and bond prices tend to move together. For example the S&P 500 and the 30Y US treasury bond. According to Murphy this relationship reverses in a deflationary environment. Bonds and commodities When commodities rise bond prices tend to fall because rising commodities are a leading indicator of inflation. When commodities fall bond prices tend to rise. The list above is not exhaustive by any means but gives an idea of the many relationships that exist. In this post I want to look at the practical side this subject. What I will show is how just a basic knowledge of these interactions can produce a reliable trading system. With this, trade signals can be predicted with a good degree of certainty; much higher for example than those produced by basic technical indicators that look at a single market. Divergences are where two markets which usually follow a relationship split apart from one another. Take for example where two markets usually rise and fall together. A divergence takes place when one rises and the other falls. Where one market follows the other, there is often a delay where a move in the leader market is not fully-priced into the follower. This is because the fundamentals often take time to catch up. Intermarket divergence shouldn’t be confused with oscillator divergence which is a completely separate strategy. Let’s take a practical example. We know that currencies like the Canadian dollar and the Australian dollar tend to move in the same direction as industrial metals and other commodities. And the rise of commodity prices tends to push up interest rates in those countries. Thus the fundamentals in those economies will need at some point to adjust to higher commodity prices. In the following sections I’ll show practical examples of a) how to spot the relationships, and b) how to trade when these situations occur. Look for two markets that have monthly correlation above 0.6 or below -0.6. Step 1 is easy. You can use our free correlation indicator to check for relationships. For step 2 use our chart overlay indicator to look at the two markets side by side to get a feel for how they move together. This indicator will synchronize the chart and it will be much easier to examine the relationship. Look closely at the periods of divergence. If the divergences are significant it’s also helpful to look at any news events that are happening during that period to understand probable causes for the markets deviating from one another. Step 3: Trade against the weaker market. First of all look at the predominant trend. If the weaker market is moving against the predominant trend then the best course of action is to trade against that move (fade it). What do I mean by weaker market? When you have a correlation between two markets, often there is a direction of causality. What that means is that one market tends to lead and the other follows. For example, if oil prices rise, all things being equal the Canadian dollar would tend to rise as well. However if the Canadian dollar rose on its own for example because of an interest rate rise, this wouldn’t necessarily push up oil prices. That interest rate rise would more than likely be a response to rising oil prices. What happens if the stronger market moves against the trend and the weaker market doesn’t? This case requires a judgement as to the size of the move and any fundamental causes. You could trade against the trend of the weaker market in anticipation that the weaker one will also reverse. But this is risky. If in doubt, stay out. There will be plenty of more certain cases. The following four examples demonstrate how this strategy works. The Australian dollar correlates highly with certain commodities futures. The yen meanwhile tends to be the opposite. In this example I am charting the relationship between platinum and AUDJPY. The longer term correlation with platinum and AUD is fairly strong and is usually above 0.7. Positive correlation means both markets tend to move in the same direction at the same time. The figure below shows the two markets plotted on the four hour chart. The lower section shows the long period and short period correlation for this scale. The dark solid graph is the short period and this is clearly cyclical. These rises and dips create good opportunities for divergence trades. Click the chart to see an expanded view. In the above I am using an automated divergence indicator to identify the trade entries using the method above. The trades are marked with the red and orange lines and occur at points where the two markets split from one another. As can be seen all of the divergences create very profitable trading opportunities. For example trades 2, 3, 4 and 5 marked on the chart are sell signals on AUDJPY. These all precede fairly heavy bear market selling. The signal from the indicator often occurs just before the trend reverses in a big way. These pairs have a strong an inverse relationship. When one goes up the other goes down. This means their correlation is negative. The reason for this is that both AUD and CAD tend to move in the direction rising commodity prices, while USD and JPY tend to do the opposite. In the above chart I’ve inverted AUDJPY to give a better sight of the relationship. In other words it is JPYAUD. As can be seen from Figure 2 there’s a very close relationship between these two markets. USDCAD and AUDJPY have a monthly correlation of -0.67 at the present time as Figure 3 shows. 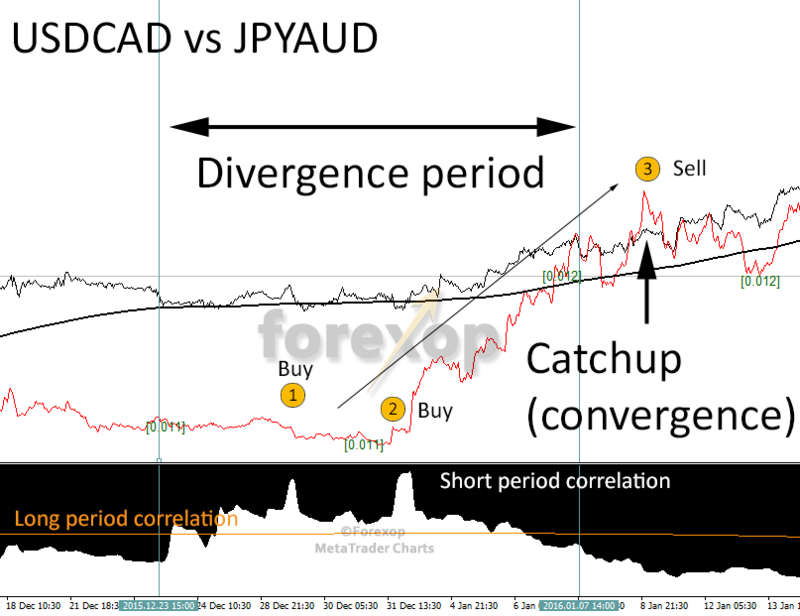 If you look at Figure 2 above, you can see at 3 that JPYAUD (red line) starts to diverge from USDCAD (black line). This was due to some weak economic data affecting the Australian dollar. Following this period we see some overshoot as JPYAUD strengthens, possibly beyond fair value (see overshoot at 4). At this point I could enter the market short and sell JPYAUD because it seems to be getting ahead of itself. In this case though, I would be trading against the fundamental trend and this is risky. Namely, I would be trading against a strong upward trend driven by the commodity down cycle. Alternatively, point 5 presents a less risky choice because here the market corrects lower and undershoots. At this point I can long JPYAUD. As the graph shows the markets do indeed converge again later and the buy (or sell on AUDJPY) yields a good profit. Figure 4 below shows this trade sequence. 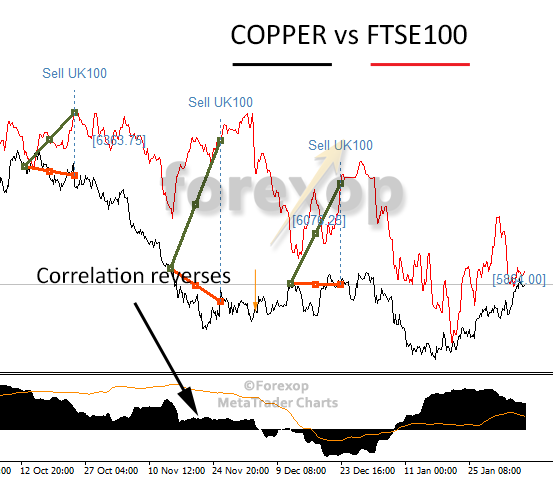 Copper has a monthly correlation with the FTSE-100 of 0.78. The markets follow each other on a macro level. This is due to the heavy weighting of miners in the UK’s main share index. When the price of industrial metals like copper rises, this tends to be in line with the rise of mining shares on the FTSE. Likewise drops in the value of copper decrease the earnings of miners and the shares nosedive. On the short term, hourly and daily correlation is usually much looser because both markets have very different dynamics. This is where profitable trading situations arise. The chart below shows the relationship over a one year period. The trade recommendations in Figure 5 are generated automatically by the divergence indicator using the rules above. In the periods of divergence the short-term correlation generally falls clear below the historical monthly average. Notice that in some periods the correlation even reverses. You can see this clearly in Figure 6. Out of the 10 trades shown, all yield a substantial profit where the trading rule is followed. The average profit was more than 300 pips per trade. As I said above, Canada’s economy is dependent on oil and gas production. Therefore it’s not surprising that its currency rises and falls in tandem with crude oil prices. 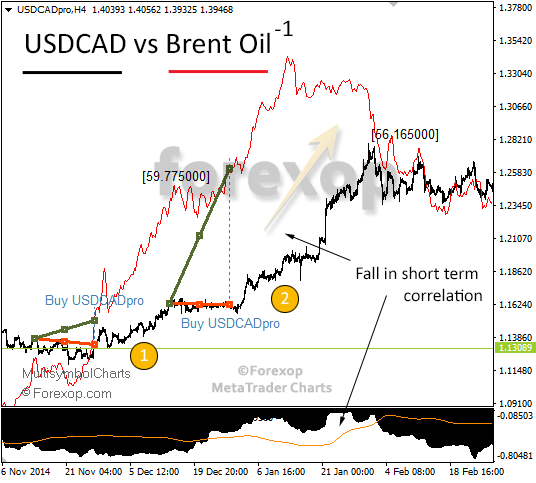 The chart below plots the price of US dollars against Brent crude and USDCAD (US dollar against Canadian dollar). In this example there are three individual markets to consider: Brent oil, US dollar and the Canadian dollar. I have flipped the price chart for Brent crude (UK Oil) because there is an inverse relationship with USDCAD. In other words, falling oil prices are usually accompanied by rises in USDCAD, all other things being equal. The monthly correlation of the two markets is typically around -0.8. 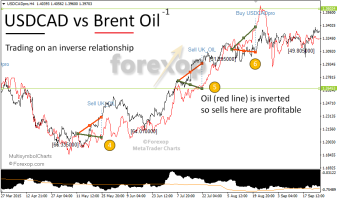 As the chart is inverted, sells of UK Oil are profitable when the red line rises. The actual chart is shown in the small box in Figure 7. The chart sections below show two example trading sequences. Looking at the chart section in Figure 8, the signal initially generates trades 1 and 2. These turn out to be decent trade openings for buying USDCAD. 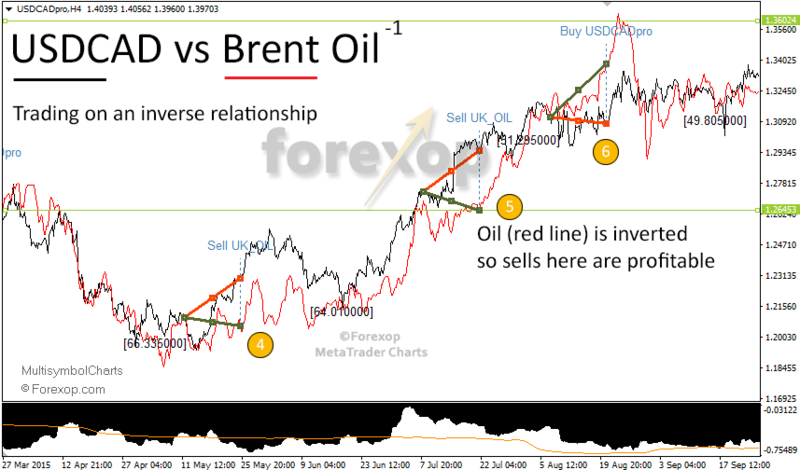 Here you can see a clear separation between the markets as Brent oil-1 (red line) rises rapidly but USDCAD fails to catch up at this point. Note that the indicator window shows contracting near term correlation. This confirms that the markets are temporarily separating (diverging) from one another which here is easily seen by looking at the chart. Trade entries 4, 5 and 6 also produce respectable profits. Trades 4 and 5 sell UK Oil and trade 6 buys USDCAD. The table below shows the entry and exit points for each trade. In this article I’ve demonstrated a system for trading divergences between two related markets. Markets are more connected than ever, and there are plenty to choose from to apply this strategy effectively. In my experience this strategy works best on longer time frames; I typically use the four hourly or daily charts to do the analysis. I find that below this there is usually too much noise; the correlation measures at shorter time frames are often unpredictable. i liked this article very much, but how do i identify a divergence between 2 assets? I thought when one market does a higher high for example and the other pair not, this would mean it is a short oppertunity in the pair which does not made a higher high? is this correct? Or did i got it wrong? There are several ways that you could do it. You could check to see if the correlation coefficients between the two markets are getting smaller on the shorter time frames. Or you could, as you rightly say look at pattern heuristics such as higher highs or lower lows and use that to judge when they are diverging or not. I enjoyed reading your article but I have one question. How do I identify a divergence between 2 assets with a monthly correlation of 0.6? I have understood it like that, that if one of the markets makes, for example, a higher high but the correlated asset does not. I would be selling the pair which does not make a higher high? Or did I got it completely wrong? This looks like a great strategy with very reliable entry signals. What do you use as an exit signal or profit target? Do you simply use convergence, or do you find that it can give back a lot of profit, particularly if the trend starts to fade? The simplest way is to use a profit target that’s about the same order as the divergence. So for e.g. if the divergence is about 3% then that would be the profit target. Alternatively if there’s strong evidence over the time period that one’s a leader market then convergence back to that main trend can be the exit signal. How do you overlay the two charts onto one? I cant see how to do that in metatrader. I’m using the the Multisymbol chart indicator (https://forexop.com/?wpdmact=7125). There are a few alternatives around but this one was created with this job in mind.